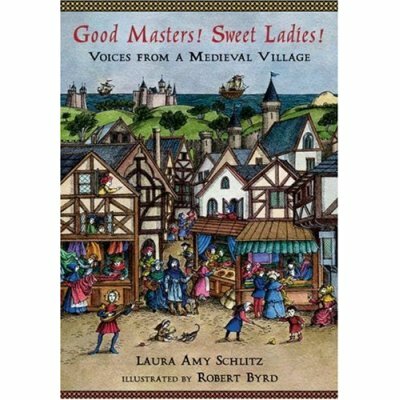 This book is a collection of monologues of all the various kinds of children who would have lived in a typical manor village in medieval England. The characters range all the way from the lowliest beggar to the loftiest Lord’s daughter. Each monologue depicts a scene from the daily life of the speaker. Interspersed among the speeches are brief one-page descriptions of various aspects of medieval life and the book is illustrated throughout. This book is an excellent example of how simplicity can be as deep and meaningful as long descriptive narratives. The voices of the villagers come to life in first-person monologues that are written with as much vibrancy and clarity as the sweetest poetry. We get to hear the children’s assessment of themselves and their place in the world through their own words. Even though the monologues are brief, they are informative and interesting. It would be difficult to choose my favorite monologue; I liked them all. From the first speech of Hugo, the Lord’s nephew, I was drawn in to the medieval world. I especially enjoyed the duel-monologue between the Jewish son of a moneylender and the Christian merchant’s daughter. They each spoke separately, their voices overlapped, illustrating that though they were from different walks of life, they shared many of the same feelings. Another wonderful addition to the collection of distinct voices is the intermittent background information about some of the aspects of life in this time period. For example, after Constance, the pilgrim, beautifully speaks about her trek to Winifred’s Well and her belief that the well will heal her misshapen body, there is a brief description of what medieval pilgrimages were like. The combination of first-person voices and third-person descriptions makes this book absolutely remarkable. I have to include a note about the wonderful pictures throughout this book. They are so pretty, fun, and charming, and a great addition to the beauty of the words. They seem to have been inspired by illustrations of the time period, because they give the book a middle-ages look and feel. Also, this book contains what is perhaps the best thing any book can have, a map of the setting in which the stories take place! Thank you, Mr. Byrd. I usually like to offer specific age-range recommendations, but I would recommend this book to anyone, from age 8 and up. It is one of those great books that everyone should read. I would especially recommend it to those interested in medieval history, obviously, and also as a read-aloud book. I would dearly love to see these monologues acted out on stage; it would make a great play for school-age kids to produce. It is a great introduction to the time period and a wonderful look at what life might have been like for children in the dark ages. 5 boots. I don’t do this often, but this is a true book trek. I checked this book out of the library, and now I’m going to have to buy one to keep. I know I will read this many more times and will happily share it with others.